In one sentence: there is nobody else the Kremlin trusts to maintain control over the Republic as well as Kadyrov has been able to do. The truth is that Kadyrov has the Kremlin over a barrel, and everybody knows it. He has essentially eliminated any threat to his grip on power. The Yamadaevs were eradicated, Alkhanov was always too weak, an d Baisarov is dead. Dzhabrailov is a possibility, and may just be biding his time. But say you replaced Kadyrov with someone like Dzhabrailov. What guarantee does the Kremlin have that he’d be able to maintain the kind of control that Kadyrov regularly brags about? Now, of course, Kadyrov’s control and stability reassurances are overstated. There have been several fire fights in the past year that have led to casualties on the part of the authorities, but the information is ruthlessly suppressed. 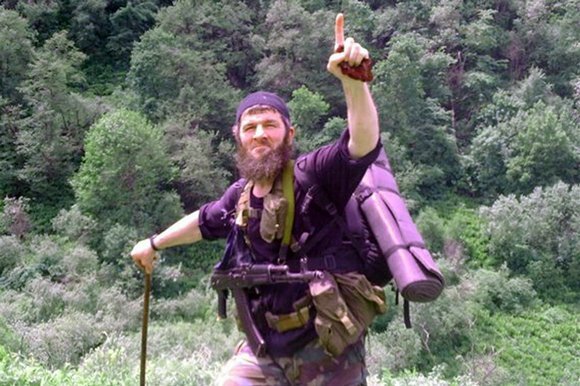 The danger now is that Kadyrov will continue to extend his reach. It was thought that he called a halt to the border dispute with Yevkurov in an attempt to show solidarity in the run up to the Winter Olympics in Sochi. But it looks like things have quietened down on that front for the moment. Meanwhile, however, it appears that he is making moves to assert his influence in Crimea. In a recent post on his Instagram account, Kadyrov indicated that money from the Akhmad Kadyrov Foundation (a charity managed by Ramzan’s mother) would be used restore a mosque in Sevastopol. Things are moving quickly in Ukraine, and it seems that everyone has an opinion. Many of the long-time Russia watchers have been saying “I told you so”, but as usual, that is annoying and unhelpful. At this point, the question must be asked, “What if Putin is not a rational actor?” And if he is not a rational actor, what happens then? Does Russia’s Defense Minister, Sergei Shoigu, follow through anyway? My gut says yes. And after the heights of pandering that were reached at the Federation Council on Saturday night [http://www.youtube.com/watch?v=mlc4-VMDlOM&feature=youtu.be], it is safe to say that there are no checks on Putin’s power. And who can or will challenge Putin at this point? It is becoming clear that the West will not or cannot act in a meaningful way. There were rumours floating around last night about Germany dragging their feet on revoking Russia’s membership in the G8. And NATO’s statement last night echoed support for Ukraine’s sovereignty [http://www.nato.int/cps/en/natolive/official_texts_107681.htm], but gave no consequences for what would happen if Russia did not honor it. Lithuania and Poland reportedly called for consultations according to NATO’s Article 4 [http://www.lithuaniatribune.com/64476/lithuanian-polish-presidents-call-for-nato-treaty-article-4-consultations-201464476/], but the Rasmussen denied this at a press conference last night. Even the option where Tymoshenko goes to Moscow and hands over Crimea to Putin, but heroically averts World War 3, is off the table. But I would not exactly discount that at this point. Maybe it would not be Tymoshenko, but another Ukrainian politician. So the answer lies with Dmitry Medvedev’s government. But it has been declawed and defanged. The final humiliation in September 2011 was… well, it was final. Former Finance Minister Alexei Kudrin threatened dire economic costs for taking Russia to the brink of war [https://twitter.com/Aleksei_Kudrin/status/439774457453092864], but he is not even in the Government anymore. The current Finance Minister, Anton Siluanov, is probably also unhappy, but he doesn’t have much clout either. The Ministry of Defence is probably eating this up. I imagine that they have dreamed of this for years. And who else is there? There isn’t anybody. There is no respected voice of reason in the Russian establishment who is willing to speak up and call this a massive miscalculation. Even if there were a group large enough or powerful enough to oust Putin, who would or could they replace him with? How do you reconstitute Putinism without Putin [https://twitter.com/MarkGaleotti/status/440015534533660672]? You cannot. It is impossible. The whole system (and all that lovely money) would collapse. But it may do so anyway. In the end, Putin has fractured his own elites to such an extent that a coup is nearly impossible. They could not coordinate an overthrow because they’d be too busy bickering over who got what and how much. And forget an agreement on a replacement. They had a compromise figure in Medvedev, and that completely failed. Putin sits down for talks, pushes the Western powers as far as he can (everything east of the Dnipro? ), and declares himself “satisfied”. Then whatever is left of Ukraine becomes a kind of buffer state with Polish and Lithuanian troops protecting it. And this becomes the status quo until something else goes wrong. Screenshot of my computer last night. I was trying to date each video. Umarov has done what he set out to do. He has proven that he is capable of carrying out some kind of attack. And he has already done that. Or rather, he has proven that Riyad-us-Saliheen is still operational, and capable of infiltrating Russia proper. Now all Umarov has to do is sit back and wait. Because anything that happens in the next month or so will be blamed on the North Caucasian insurgency (aka: Caucasus Emirate). The murder spree in Stavropol this week is a prime example. The authorities now allege the crime was committed by men from the Zolksy Jamaat (a militant group) from Kabardino-Balkaria in revenge for the fact that they were nearly wiped out back in October. This sounds a little too cut-and-dried to me. There are too many unknowns about the Jamaat system for the cops to make that claim with any authority. Therefore, I am not ready to dismiss the organised crime theory. Meanwhile, it took the authorities 2 weeks to round up six suspects in the car bombing in Pyatigorsk. And they are still looking for the organisers of the twin bombings in Volgograd. Journalist hops commuter train in Krasnodar bypassing security on January 5th. Ends up in Sochi (250km away) where he passes several different sets of cops and soldiers, who don’t even notice him. Conclusion: it would not be that hard for a terrorist to avoid security measures set up for Sochi. Note: this experiment took place after the double bombings in Volgograd, but before the Olympic security regime in Sochi went into effect. With just 40 days until the Winter Olympic Games in Sochi, a suicide bombing took place this afternoon in Volgograd, Russia. Media reports 18 dead and 60 injured so far, but that number is expected to rise. It appears that the perpetrator of the attack was a female, keeping in line with previous attacks of a similar nature. The suicide attack on a Volgograd bus in October was also committed by a woman. On Friday evening, a car bombing took place in Pyatigorsk, Stavropol. I expect we will know more about how the bomb used in the Pyatigorsk attack was constructed and what it was made with in the next few days. While they did manage to blow out quite a few windows and killed 3 men, the act itself appeared to be amateur. Caucasian Knot reported [ru] that the location chosen did not experience high traffic, with a local saying that she thought the attack was against the police and not civilians. However, if the goal of Pyatigorsk was psychological (and it appears that it was), the amount of physical damage inflicted was immaterial. These people are not strategists, neither are they experienced. Even so, the likelihood of similar acts in the next 6 weeks is very high. The goal is psychological – striking fear into the hearts of the authorities, and making them panic. Unfortunately, what that means is that there is no way to predict the next target. The selection of Volgograd and Pyatigorsk seems to indicate that the terrorists cannot manage to travel much farther than that. Either due to problems with papers, or not enough money to bribe their way through checkpoints. Or maybe they’re just not trying. Maybe being closer to Sochi is the goal rather than a strike in Moscow. You know, I always imagined the day of Khodorkovsky’s release would be a sort of — to use the common cliché — “Mandela Moment”. And the fact that it did not happen that way feels very upsetting. Some of my disappointment stems from my own too high expectations, of course. But I have to wonder if that wasn’t the goal from Putin’s point of view. By staging Khodorkovsky’s release the way he did, Putin managed to portray the former Yukos chief as a sellout. And at his press conference in Berlin today, Khodorkovsky did little to dispel that impression. I am not going into politics, which I mentioned in my letter to President Putin and have stated many times in the past. I am going to get involved in social activities. In other words, struggling for power is not my cup of tea. I didn’t have to be out-of-proportion emotional about this because I realised that my family wasn’t suffering. That they were humane vis–à–vis my family. And because of that, I thought I should also be pragmatic. And when you are pragmatic, you don’t need to do things which are as dramatic as hatred would be, or revenge. The big news from Russia is that nothing has changed there since the 15th century, only now we have confirmation via Twitter.